If you have a felony conviction, consider looking for local, entry level mechanic jobs. Historically, this field has a better track record of hiring felons than other types of occupations. You chances of getting a job may be significantly better if you already have basic mechanical skills/training or are willing to learn. Inspect, repair, and overhaul buses and trucks, or maintain and repair any type of diesel engine. The outlook for this profession for 2014-2024 is that it is expected to grow faster than average, at about 12%. This means you have a higher chance of getting hired, because more positions will continue to open up. You may end up working for a local trucking company that services it own trucks. Your job will be to inspect, maintain, and repair cars and light trucks. As a felon, you probably have the highest chance of landing a job as an auto mechanic or a mechanic’s helper to start with, simply because there are so MANY small and large repair shops. This is especially true in big cities. 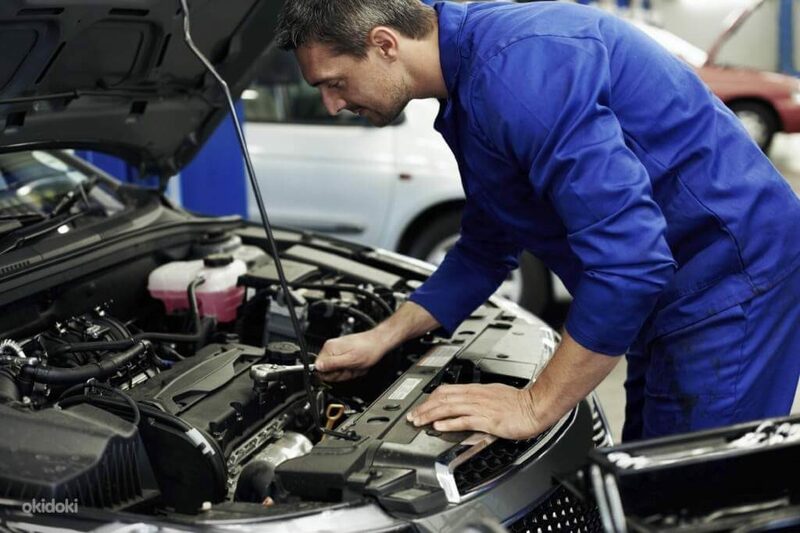 In addition to trying your luck in small car repair shops, you should apply to car dealerships and automotive service chains such as Pep Boys or Jiffy Lube. An alternative within this profession is to train to restore, refinish, and replace vehicle bodies and frames, windshields, and window glass. This specialty labor pays a few thousand dollars more a year than a car mechanic. You will be inspecting, maintaining, and repairing large vehicles and machinery, such as bulldozers and tractors. These are used in construction, farming, rail transportation, and other industries. Because this job requires hard manual labor and is often conducted in unpleasant conditions (a lot of noise, grease and dirt), you may be more likely to get it as a felon, since it is less desirable to many people who have a clean record. Work as a service tech who inspects, repairs and maintains commercial cooking equipment and appliances. This may be a good option because restaurant equipment is usually serviced by small to mid-size companies, which are more likely to give you a chance than a bigger business with an HR department. On the downside, there will not be many companies in the area who do this type of repairs, so there are fewer potential opportunities. Still, because this job does not require prior training, you can still apply for this job. Average pay: $34K / year. What type of training do you need to become a mechanic? You can go to a vocational school and get trained and certified to be a particular type of a mechanic: for example a diesel mechanic. However, this is not necessary to get employed. While many places may prefer a certificate, they also may equally prefer to take someone who wants to learn, pay them less (more savings for them) and train them on the job. Many positions only require a High School diploma or equivalent. You should also keep in mind that having a certificate may not give you too much advantage when weighed against your criminal record. You may consider simply getting a job as a mechanic’s helper, and working for some time. If you like the career and feel like you want to advance in it, you can enroll into a training program. As a felon, you are more likely to be hired by a small business owner than a large company or chain. There are a few reasons for this. First, the owner may not care and/or have the money to conduct a background check (they are expensive). You should still be honest about your past, without going into too much detail. Second, small businesses are looking for very hard working people and some employers will be willing to give you a chance, realizing that you will work extra hard to keep the job. Lastly, you have the best chance of making a good impression on the owner himself, who may be willing to take a chance on you, rather than talk to an HR manager at a larger firm, who will not care, and will likely prefer someone with a clean record. Tip: find every single small auto-repair shop in your area and any other location you are willing to travel, and go there in person to talk to the boss. Yes, this may take a lot of time and effort, but this approach will greatly increase your chances of eventually landing a job. Understandably you want to get hired as a mechanic right away, especially if you already have the skills and experience. However, in order to get your foot in the door, you may need to settle for less: you may get a job as a mechanic’s helper to start. If you stick with it and are good at the job, you will be promoted to be a mechanic and earn better pay. Even if you are not promoted at this job, you can start looking for another one. You will have a much better chance landing an offer, if you already have a job. The worst thing you can do is say “I will never work for minimum wage”. Sometimes you have to make sacrifices today, for a brighter future tomorrow. If you get a job offer, don’t turn it down just because its below your skill level and pays less than what you were hoping for. Lets face it, its hard enough to get a job these days, even WITHOUT a felony. Your application will be in a mix with dozens of people whose skills are just as good, or better, who DON’T have a criminal record. So why should you be the one hired? There is only ONE REASON: because the boss or the hiring manager simply LIKES you as a person and is willing to give you a chance. This means that during the interview, you should make an effort to connect with the interviewer on a personal level, tell you story, talk about your character, willingness to learn and work hard, etc. – Roofing / Construction – most small construction company owners never run background checks or even ask you if you have a conviction, so it’s possible to find well paying roofing and construction jobs. – Freelancing Jobs for Felons – if you have computer / graphics design / writing / audio or video making skills, you can work online as a freelancer, taking on small contract jobs. These jobs almost never require a background check, so your chances of success are much higher!